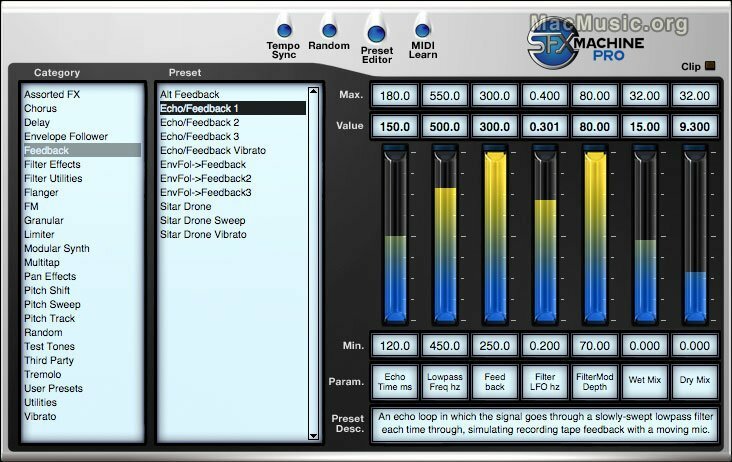 The Sound Guy has released version 1.1 of SFX Machine Pro. * Added an extra programmable slider to the main screen. * Provided separate Wet Mix and Dry Mix controls for most presets. * Added 3 new presets: Mono Unlike Stereo, EnvFol->Pitch Shift, and Feedback Eliminator. * Set latency value correctly. * Fixed invisible parameter numbers in the Preset Editor (VST version). * Added additional VST 2.4 support. * Fixed potential crash bugs. * Fixed a bug which caused the preset Editor controls to superimpose over the main screen.